SQL Server 2016 is the biggest leap forward in Microsoft's data platform history. With competitive advantages in performance, security and price, SQL Server 2016 offers a compelling upgrade story. SQL Server delivers breakthrough mission-critical capabilities with in-memory performance and operation analytics. Comprehensive security features help protect data at rest and in motion and a world-class high availability and disaster recovery solution adds new enhancements. New capabilities perform advanced analytics directly within databases and present rich visualization for business insights on any device. Customers can also gain the benefit of hyper-scale cloud with new hybrid scenarios enabled by new Stretch Database technology that lets you dynamically stretch your warm and cold transactional data to Microsoft Azure in a secured way. In addition, SQL Server 2016 delivers a complete database platform for hybrid cloud, enabling customers to easily build, deploy and manage solutions that span on-premises and cloud. As the biggest leap forward in Microsoft's data platform history, SQL Server 2016 delivers breakthrough mission critical performance, deeper insights across data on many devices and enables the power of hyper scale cloud to unlock new hybrid scenarios. Performance. Enhanced in-memory performance with up to 30x faster transactions, more than 100x faster queries than disk based relational databases and real-time operational analytics. Security Upgrades. Always encrypted technology helps protect your data at rest and in mention, on-premises and in the cloud, with master keys sitting with the application, without any application changes. High Availability. Even higher availability and performance than SQL Server 2014 with AlwaysOn gives you the ability to have up to 3 synchronous replicas, DTC support and round-robin load balancing of the secondaries. Scalability. Enhanced database caching across multiple cores & support for Windows Server 2016 that efficiently provide scale, computing, networking and storage in both physical and virtual environments. Access Any Data. Query relational and non-relational data with the simplicity of T-SQL with PolyBase. Manage document data with native JSON support. Scale and Manage. Enhanced performance, scalability and usability across SQL Server Enterprise Information Management tools and Analysis Services. Powerful Insights on Any Device. Business insights through rich visualizations on mobile devices. Native apps for Windows, iOS and Android. New modern reports for all browsers. Advanced Analytics at Massive Scale. Built-in advanced analytics provide the scalability and performance benefits of running your “R” algorithms directly in SQL Server. Expand your analytics library with Microsoft Azure Marketplace. Breakthrough Hybrid Scenarios. Stretch Database technology keeps more of your customers’ historical data at your fingertips by transparently stretching your warm and cold OLTP data to Microsoft Azure on demand without application changes. Simplicity. New tools that make SQL Server migration to Microsoft Azure and hybrid scenarios even easier. Consistency.Consistent experience from on-premises to Microsoft Azure IaaS & PaaS. 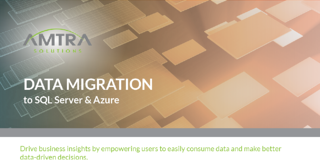 Find out more about how AMTRA can help you use SQL Server or Azure to drive business insights by empowering users to easily consume data and make better data-driven decisions. Click on the image to download the datasheet. Do you want to run workloads securely, get the most out of big data and gain a high-performing infrastructure? Check out the datasheet below to learn how AMTRA can help you do all of the above. AMTRA’s SQL Optimization, Server Mapping and Cloud Readiness offering is designed to provide our customers with a complete view of their current state of Microsoft server and SQL product deployment. In addition, our experts will determine your effective deployment position to establish any potential return on investment opportunity in respect to your current Server and SQL deployment strategy and state. AMTRA will also create a Cloud Migration strategy & consult on on-premises cost saving and incentives regarding enterprise licensing. AMTRA's close partnership with Microsoft allows us to deliver customized data platform solutions to our clients. Ask us if your SQL Optimization is eligible for funding in whole or part by Microsoft. The path from Oracle to SQL Server isn’t as complex as it looks – with the right team behind you. With AMTRA, Oracle costs can be drastically reduced by leveraging SQL Server 2016. Current Oracle customers work with our experts at AMTRA to determine the most cost-effective and logical plan for migrating your business to SQL Server. Making the transition to SQL reduces costs by allocating resources more effectively, consolidating databases, virtualizing servers, compressing data, & managing with policies. With the built-in ability for end-users to generate their own business intelligence reporting, SQL provides a more independent IT environment in a more cost-effective way. AMTRA will ensure each Oracle workload option is able to be transitioned to the new application system, and put in place our tool to automate data migration from Oracles tables to SQL Server. AMTRA's team provides you with an assessment of your current state Business Process or IT Landscape, recommends prioritization of issues, & develops a best practice design for Oracle workload migration. We'll ensure your Oracle licensing supports the new Oracle migration options, taking into consideration architectural requirements and operational support to ensure the smoothest transition. AMTRA specializes in Oracle License Reviews - we'll give you a complete picture of your Oracle licensing situation & make recommendations on where and how you can save money. NOT SURE YOU ARE READY TO MODERNIZE? Download our handy checklist: "7 Signs It's Time to Upgrade Your Data Platform" to learn if modernization can improve your business, then schedule time with one of our data specialists to get all of your questions answered.